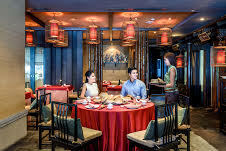 The award-winning Lok Wah Hin, having been voted the Best Chinese Restaurant in Bangkok for nine consecutive years, offers extensive array of creative discerning diners a vast array of over 400 delicacies from around China. 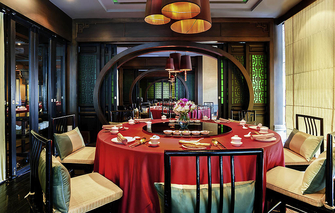 Famous world-wide for its Peking Duck and Dim Sums, in a classical Chinese village style atmosphere. Private dining rooms for 10-50 persons. I ordered 8 dishes for dim-sum. All are tastety. Service is great. Only one thing to comment is there is only dim-sum menu. Other menu is temporary inavailable during my dinner. Waitress informed that they are under revise their menu. This restaurant value for money in case you have member card with 50% discount on a la carte. LE BUFFET DIM SIN EST TRES BON ET IL NE FAUT PAS OUBLIER DE PRENDRE LA SOUPE ET LES DESSERTS COMPRIS DANS LE PRIX AINSI QUE LE RIZ OU LES NODLES DU JOUR POUR CEUX QUI ONT ENCORE DE LA PLACE CE QUI N ETAIT PAS MON CAS. LA CUISINE EST TJRS TRES BONNE. We are impressed with your serviced. Especially, the man who take care us all our dining. He is very nice and professional. Your Dim Sum buffet is very delicious and good quality. Food looks good but taste is not for Thai. Arrived for a birthday and anniversary dinner were given a menu each when we looked at it it was an all you could eat menu of ALL steamed Chinese food. A few waitress make long waiting service. Dim sum buffet was good. We booked online and got half price but we think the usual price is already cheap with respect to the food quality. The private room they gave us incurred no extra charge. The only problem we had was withthe online reconfirmation system and had to call the restaurant instead. First of all I want to thank you for solving of my reservation while the online booking was malfunction. The very mistake I received for this meal was not enough quantity of food, people come by the buffet promotion but the restaurant can only be served for 30% on the menu. While we wait for the order (about 10-20 minutes) there no announce from the waiter that menu was ran out, instead they bring the other main disk to serve us and no explanation from their until we ask them for our order. This can be lead us to sue your company that you not serve us for what you said in the promotion, never expected before that my whole life will faced these circumstance from restaurant inside the 4 stars hotel....!